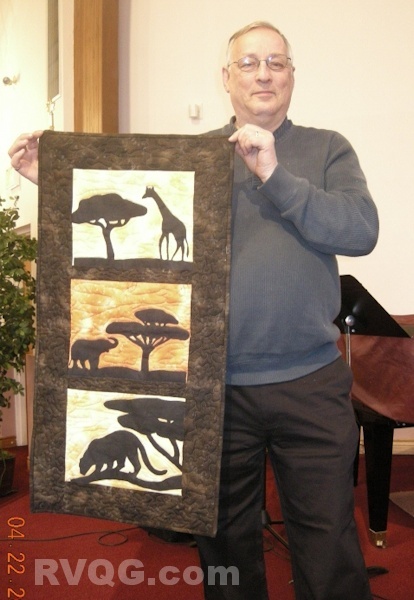 This month’s guest speaker, Garnet Smalley, from The London International Quilt Festival, provided an entertaining and educational trip to Africa through a selection of quilts from many African countries. They were just a small sample from a group of over 150 quilts that will be featured at the London International Quilt Festival, in London Ontario – June 12-15, 2013. Quilts styles were varied, but the colours were bright and exciting. Quilts included beading, stamping, metal embellishments, and fabric weaving. Many featured native wild life – giraffe, elephant, landscapes or the typical daily chores of the women including water carrying using jugs on the head, or celebration in dance. Stories from Zimbabwe, Nigeria, Kenya, Namibia, and Uganda were depicted through beautiful graphic quilts. Garnet shared his African travel stories in pulling this collection together – including tales about pot holes that were way beyond the size that we manoeuvered through our parking lot. The show collection of quilts is still growing with quilts from Nigeria...that were made by men! The show displays will provide details on each quilt, as well as workshops, lectures and vendors – some featuring African fabrics. It was a great presentation exposing us to a taste of Africa through quilters’ efforts from around the world! For more details please visit the show website here.